Having the option to work remotely for a company is one of the great benefits of the internet. But, on the flip-side, one of the downsides of the internet is the online scams. And, if you’re new to online job search boards, you probably aren’t sure which websites are legit, and therefore could be more susceptible to rip-off jobs. 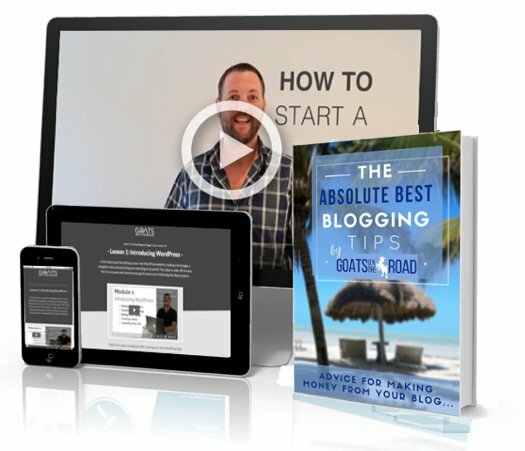 So, how do you sort through all of the online postings to find legitimate online work? 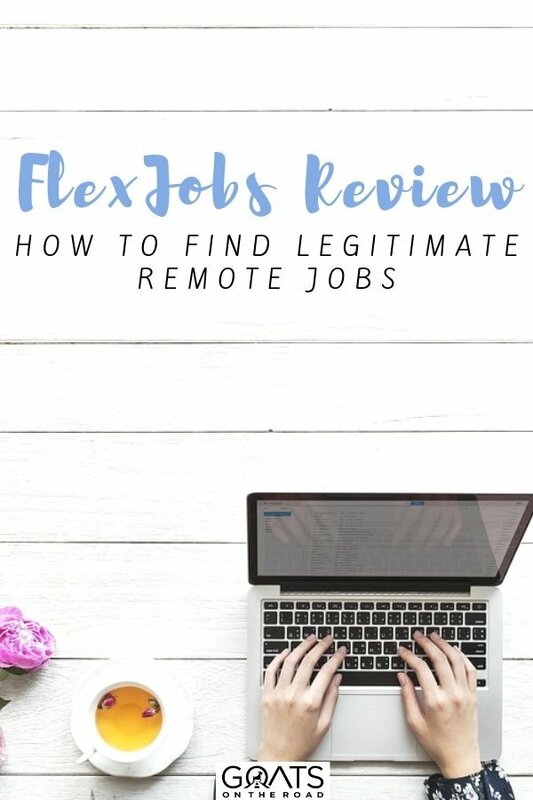 In this post, I’m going to review FlexJobs, which is one of the top websites for finding remote work. We’ve recently partnered up with them and are excited to share this FlexJobs review with you. 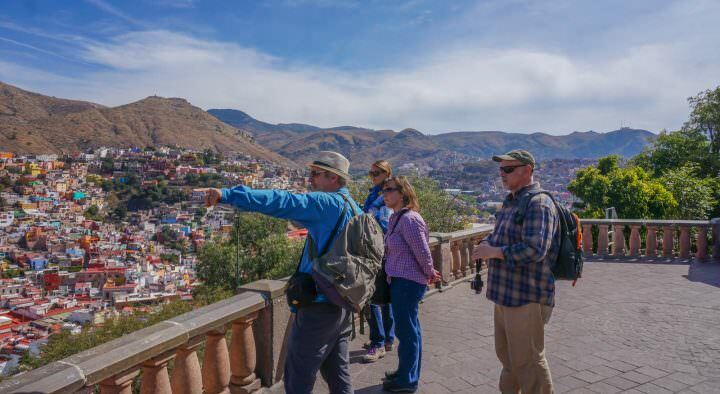 We’re all about flexibility with our travel blogging job, and love the freedom that working from anywhere in the world has provided us — and we want that for you, too! 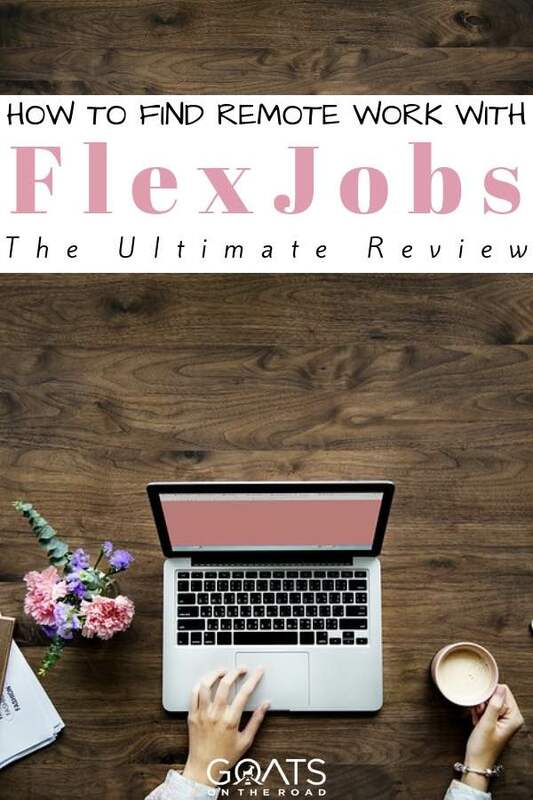 In this FlexJobs review, I’ll list some of the current jobs postings, how to sign up, what to expect after you’ve signed up, the perks, the costs, pros & cons, and success stories from people who have found jobs. If you’re interested in having a more enjoyable, flexible career, read on for my FlexJobs review. First things first, FlexJobs is not a scam. 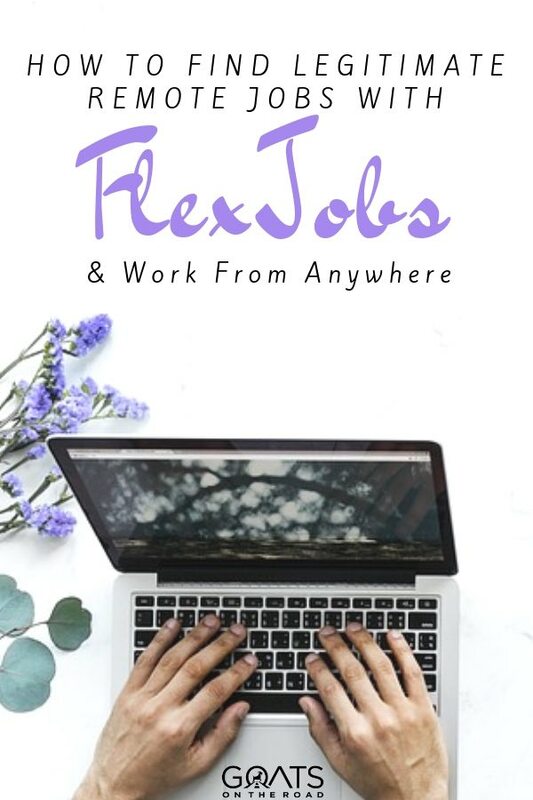 FlexJobs is currently one of the top (if not the top) website for finding full-time remote work, part-time remote jobs, and in some cases, freelance work. The company has been around since 2007 and all of the employees work remotely. Sarah (the founder) practices what she preaches. There are more than 30,000 jobs listed with over 5,000 different companies, in 50+ career categories. FlexJobs has a 5 star, A+ rating on the Better Business Bureau, and they’ve been featured on websites such as Forbes, CNBC, Time, NBC and Inc. 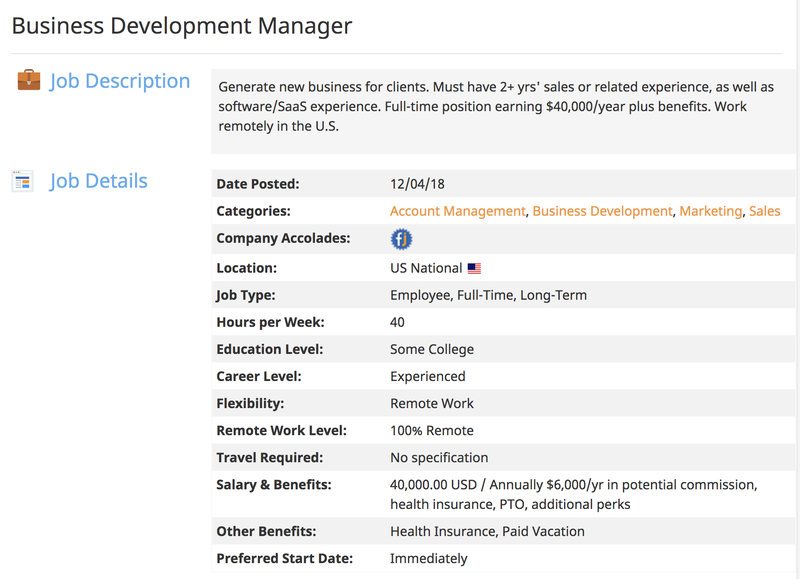 Adding to their legitimacy, the FlexJobs team hand screens each and every job posting, ensuring no spammy jobs are listed on their site…which is always a good thing. On your search for jobs, you’ll find postings in event planning, marketing, translation, project management, sales, retail, engineering, legal, and more. Ready for a more flexible career? Sign up with FlexJobs here. 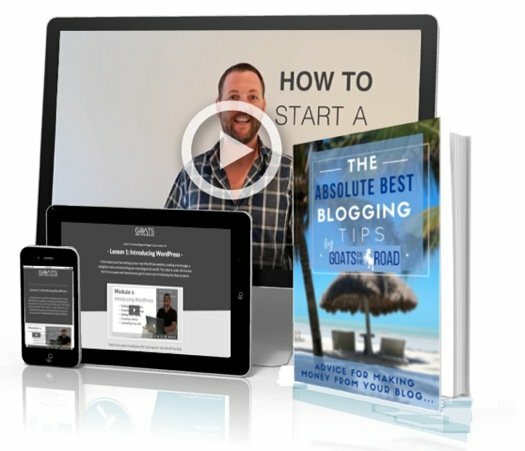 Use code NOMAD at check-out to receive 30% off the membership fee for the first month. FlexJobs is for anyone who wants a better work / life balance, while making money remotely (whether to supplement your current income, or as a full-time job). FlexJobs is for anyone who wants to find well-paying jobs that they can do from home, a co-working space, or a cafe…anywhere in the world. Many of the positions available on FlexJobs are for those who are legally able to work in the United States, and are currently living there. However, you could work for a company in Chicago, but be living in New York. Some of the jobs have location requirements, which is due to a few reasons. One reason is the companies prefer their employees to be in a similar (or exact) time zone as them, or you might be required to attend meetings every so often. Having said that, there are numerous positions available where the employer doesn’t care where you’re working from, as long as tasks are completed on time. There are also many international jobs available. 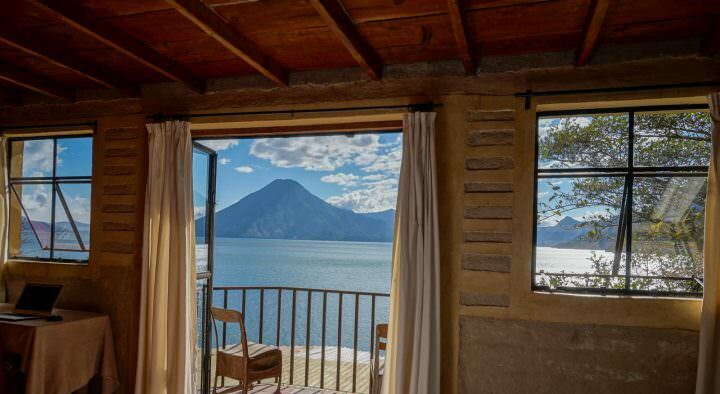 Find remote positions in Mexico, the United Kingdom, Japan, Poland, Germany, India, Canada, Australia and more. Click here to find international remote jobs on the Flex Jobs platform. As I said above, there are careers available in over 50 categories, so finding a job that suits your needs and skill-set shouldn’t be a problem. Some of the jobs require you to have “X” amount of years experience, some require a bachelor’s degree in the subject, while others don’t list the necessary qualifications. Accounting, Engineer, Sales, Marketing, Food & Beverage, Advertising & PR, Legal Jobs, Event Planning, Travel & Hospitality, or See All Categories. There’s a useful feature on the site that allows you to really zero in on the type of job and schedule you’re looking for. With the Advanced Search, you add in the location you want to work in, the job type, career level (management, entry-level, etc. ), the work schedule you prefer, how remote you want to be, and more. On top of showing you the best remote jobs available, you’ll also receive some other free perks when you sign up with FlexJobs. Members receive discounts on numerous products — Dell, Thrive Market, wine delivery, Costco, and more. Plus there are numerous resources available to you including career coaching, checklists, help with writing resumes, skill tests, webinars & videos, etc. If you’re stuck and need help with anything, you can speak with a representative support member from the USA. Some people are hesitant to pay a fee in order to find work. But the reality is, since there are numerous online job boards out there (many of which are filled with sub-par gigs), paying a small monthly fee to have the best, most legit jobs all in one place is worth it. Basically, you’re paying for convenience, quality and security. Once you’ve decided to give FlexJobs a try, signing up is simple. You add all of the standard information including your name, billing address and email address. After that, you can add which sort of jobs you are looking for, and whether or not you want full-time remote, part-time remote, a flexible schedule, etc. From there, you choose the subscription that works best for you. FlexJobs offers 1 year plans, 3 month plans and a 1 month plan as well. 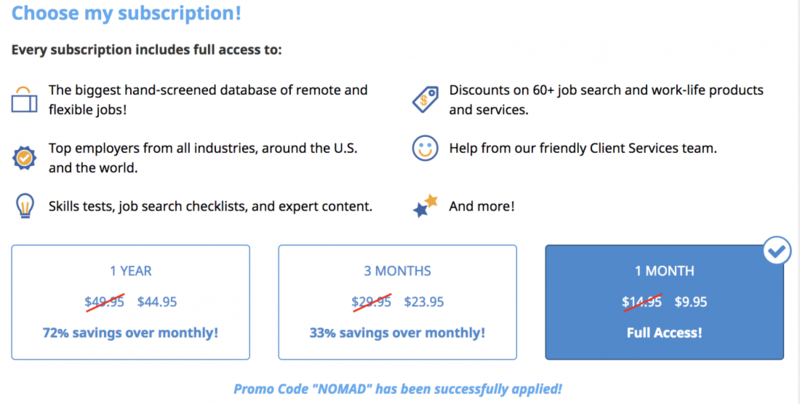 If you use promo code NOMAD, you’ll receive 30% off of the membership fee for the first month. There’s also a full money-back guarantee if you’re not satisfied. After you’ve chosen the best plan for you, simply add your credit card details and you’re good to go. If you want to cancel after one month, that’s not a problem. Click here to take a tour of FlexJobs and see if it’s right for you. What Are Some FlexJobs Success Stories? 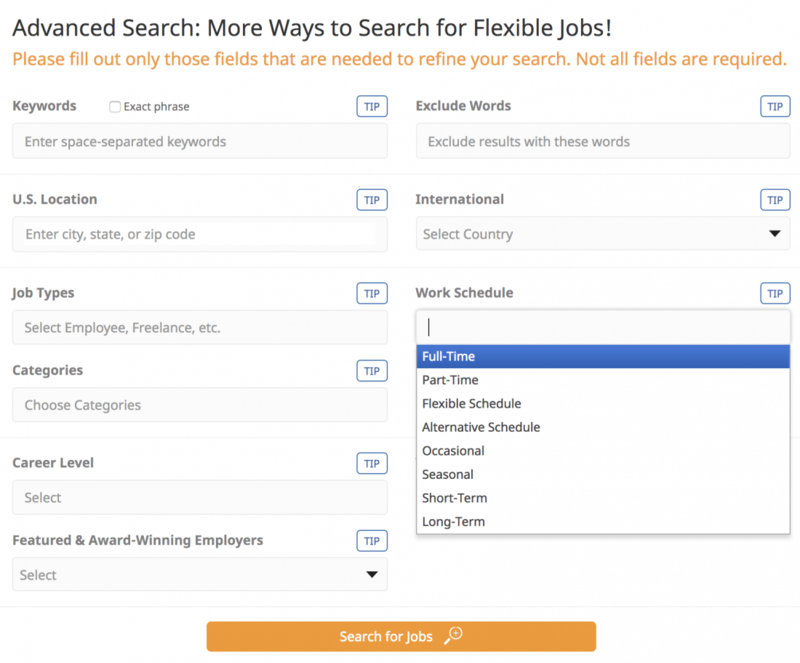 If you’re wondering if anyone has landed a job using FlexJobs, the answer is yes! 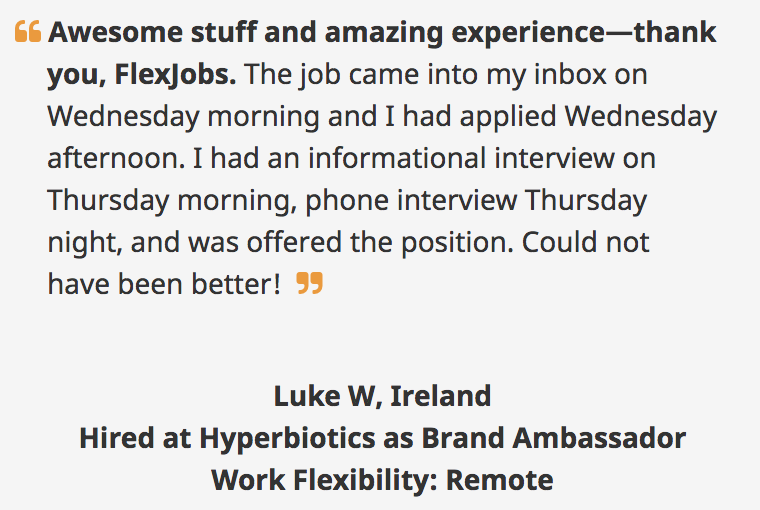 There are way too many success stories to list in this FlexJobs review. There are literally thousands of testimonials on the website from real people who have found remote, flexible careers to suit their skills. From just the first page of testimonials, you’ll see people who have found jobs as a teacher, virtual assistant, travel consultant, senior security intelligence advisor, technical support agent, staff accountant, lab support, project manager and social media evaluator. Many of these jobs were with well-established (and well-known) companies as well. Many of the success stories are from the United States, but there are countless others on the FlexJobs site from those who were hired in India, Slovenia, Mexico, England, Japan, Philippines, Germany, Ireland and many more. There are numerous pros to utilizing FlexJobs, but with anything, there are some downsides as well. These days, work doesn’t need to be in a specific place. Enjoy the freedom that FlexJobs provides and start working on your terms. On top of being able to work in your PJ’s, there are numerous health, financial and relationship benefits to remote work. Trade in your long commutes to the office and getting ready in the morning, for working from home while enjoying a better work-life balance. Ready to learn more about FlexJobs? Click here. Lead image in this article courtesy of Shutterstock.com.